A historical beach-side suburb on the False Bay coast, Muizenberg is popular with families for its long beach, warm water (by Cape Town standards), beautiful views, and activities such as mini-golf and waterslides. The beach is famous for its row of colourful changing houses and is a photo favourite from the mountain road far above. Muizenberg beach has also long been the best place in Cape Town for beginner surfers to learn and enjoy the waves. Its break is far less daunting and competitive than Cape Town's other surf spots. Several popular surf schools have been established at Surfers Corner in Muizenberg, accompanied by a few fun cafés and restaurants. False Bay is also known for its Great White Shark population, but a shark watch service is in operation to give warning to bathers and surfers. Visitors should take note of the flag and siren system which is clearly explained on signposts. A scenic walkway below the railway line links Muizenberg to the next seaside village of St James and its lovely tidal pool. The delightful fishing village of Kalk Bay is a few minutes' drive away with its protected harbour and its main street, lined with fascinating antique and art shops, as well as coffee shops, eateries and bars. 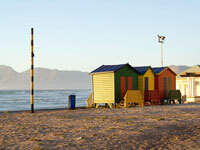 Transport: The train line between Cape Town's centre and Simonstown runs through Muizenberg.